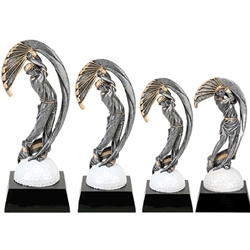 Golf Motion Extreme Trophies are available in 3 sizes: 8.25", 9.25", and 10" for Males and in a 7.875" size for Females. This exciting golf award makes a great economical award for your tournament or event. Male - Small - 8.25"